In today’s music scene, bass players are constantly looking for gear that is lightweight, portable and convenient for gigs, travel, and touring. Trace Elliot has tapped into this market by releasing The Transit B Performance Bass Pre-amp. The concept behind Transit B is to provide bass players with an alternative to lugging around heavy gear from gig to gig, and to give them a more convenient way to maintain a consistent sound in any type of venue or situation. There has never been an easier way to bring classic Trace Elliot tone along with you, everywhere you play. As with other popular preamp-on-the-floor pedals, the Transit B gives you a complete amp solution that fits in your backpack: preamp, tuner, compressor, and DI. A headphone jack and aux input also make this a great practice and rehearsal tool. With generous sound shaping abilities, great live versatility, and a cool vibe, it’s definitely worth checking out if you’re tired of the same old, traditional DI box or simply want to add some classic Trace Elliot tone to your existing rig. The Transit B is a combination pre-amp, direct box, and bass effects processor. In addition to your traditional bass EQ controls (five-band, semi-parametric), the Transit B also includes a distortion/overdrive circuit, dual-band compressor, a tone-shaping Bass Enhancer circuit that enhances low-frequency response with a subharmonic generator, and a built-in chromatic tuner. The Pre-Shape feature delivers classic Trace Elliot tone. 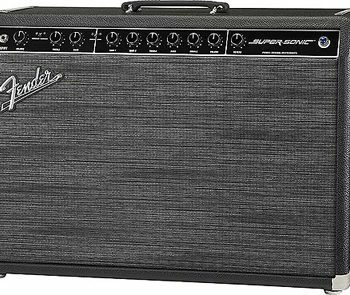 When engaged (it’s on by default), you get the company’s familiar “Mid Pre-Shape” that boosts low and high frequencies (55Hz and 2kHz-5kHz) while also cutting mids around 400Hz, particularly appealing to pop and funk-style players for a snappy tone and response. 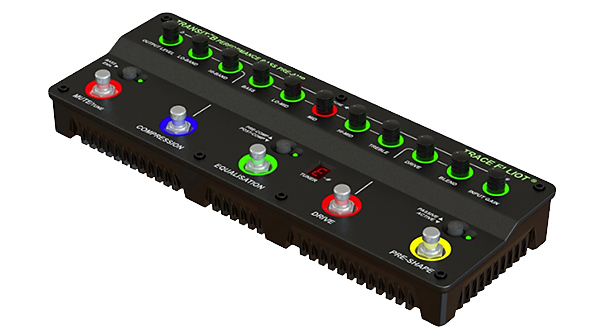 A series of eleven, green, back-lit knobs control (from left to right): Output level, Lo Band and Hi Band (compressor controls), Bass, Low Mid, Mid, High Mid, Treble, Drive, Blend, and Input Gain. Five LED colored footswitches control: Mute/Tune, Compression, Equalisation, Drive, and Pre-Shape. Three mini-switches (not for your feet) engage/disengage the bass tone enhancement circuit, select whether the compressor is pre- or post-eq, and a level toggle to switch between a bass that has active or passive pickups. Given such a full-featured preamp pedal, we would have loved it if Trace Elliot included an effects loop for our other pedals, but that would have eliminated the beautiful thing about this pedal: it’s a complete rig that fits in your hand. The unit is both light-weight and compact, with the following measurements and dimensions: 2.6 pounds, 12.3” W x 4.5” D x 2.3” H, and it includes a nice, padded carrying case. It also includes a 9V power supply. Although you can’t power it via 48V phantom power from a mixing board like some DI boxes, at just 100mA, this will work with most universal pedalboard power supplies (unlike some bass DI pedals we have encountered lately with more atypical power requirements). Operation of the Transit B was a pleasure, and the various switches and controls provided plenty of flexibility without making things complicated. The outputs provided numerous options for sending our tone straight to a mixing board or into a power amp… or both! The color-coordinated, backlit controls were both beautiful and functional, and we found them particularly handy at showing our various settings on a dark stage. While it seems like there are a lot of knobs to deal with, the backlighting behind each section of controls turns On/Off with the footswitch. For example, activating the EQ section illuminates the EQ controls, and when bypassed, the backlights turn off. When tuning our basses, besides the not value display in the center, the lights on the top row of knobs become sharp/flat guides, helping you to quickly dial in your tuning like you would with other popular tuners. The controls themselves felt very rugged, with a strong resistance to them. We never accidentally bumped the settings out of place. The Trace Elliot Transit B is a great sounding preamp pedal. When getting to know the sounds from this pre-amp pedal, we started with a Yamaha Attitude 2 Limited Billy Sheehan Signature Bass, Hartke 3500 Bass Head, and Hartke 2x12” cabinet. We also sent a signal with effects into a PA and sent a dry signal into the amp. When we applied the compressor, it definitely improved the sound of our bass as it gave it an extra dose of punch and a more concise attack. By adjusting the LO-BAND and HI-BAND knobs, we could control the amount of compression independently for the low and high frequencies and really get a clear, punchy tone. The compressed sound was great for slapping and popping. When we applied the Equalization switch we were able to create some nice bass tones. When we tried out the EQ controls, we started with our Hartke amp set to a flat EQ. In addition, it should be noted that the Sheehan bass without EQ is very bassy sounding to begin with. However, when we applied the EQ Switch, we were able to achieve a wide range of tones including classic, bright pop tones and punchy, “trademark” Trace Elliot sounds. The Drive feature is really dirty if you want to overdrive your tone—it adds a lot of grit to your sound if desired. We could enhance our tone subtly or extremely by utilizing the Blend control to blend the drive signal with our clean signal. 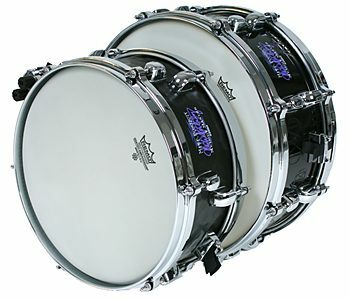 It’s the ability to dial in a wet/dry blend that really helps to preserve the clarity in your bass ton. The Bass Enhancement switch and LED incorporates a proprietary subharmonic generator circuit that is specially voiced for deep sounding bass. This switch is useful when you are playing your bass through a system with limited low frequency capabilities, or if you’ve got a bass that isn’t quite so bass heavy, tone-wise, but could also make a vintage bass sound a bit too flubby if you’re not careful. Next, we took the Transit B to the studio, where we played an NS Design WAV4 RADIUS bass through the pre-amp pedal and straight into a mixing board for recording. The results were fantastic, and dialing in some of the EQ and Drive gave us the kinds of rock tones that would normally not occur without tracking through one of our bass rigs. Ironically, this bass with Drive engaged really nailed Billy Sheehan’s tone, perhaps even more so compared to our tests with his signature bass (which would otherwise be paired with some EBS pedals that also bear the artist’s name). On this super-clean RADIUS bass, engaging the Bass Enhancement switch transformed our tone into something more vintage, big, and round. 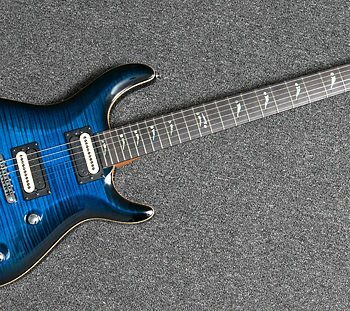 It was inspiring for both R&B style playing as well as EDM, though not as useful for rock tones. Always, this pedal was quiet, and the drive circuit didn’t add any appreciable noise. The manual is downloadable in PDF format from the Trace Elliot website. Although the product is mostly self-explanatory, this was a very good user’s guide. It fully explained the feature set and offered useful guidance as to best practices, like using the D.I. Pre output to a PA system to avoid EQ mishaps, for example, and it also provided useful information regarding the classic Trace Elliot tone circuit. The Trace Elliot Transit B (MSRP $399) sells for approximately $299, and includes a nice nylon carrying case with rubber-grip handle. Although it is slightly pricier than many similar products, this is still a good price for a bass pre-amp with such a robust feature set.